In a medium mixing bowl combine the hot sauce and melted butter. Pour over the shredded chicken and mix until the chicken is well coated. Place the chicken in a baking dish and bake for 20 minutes, stirring halfway. Let cool for 10 minutes while making the cheese shells. In a large mixing bowl, combine the cheddar, mozzarella, Parmesan cheeses and jalapenos. Divide the cheese mixture into 6-mounded balls on the lined baking sheet. Bake for 6-8 minutes until the edges are golden brown. Remove from oven and let cool for 1- 2 minutes. Using a spatula, gently flip the melted cheese over and place a few spoonfuls of the buffalo chicken on the edge of each shell. 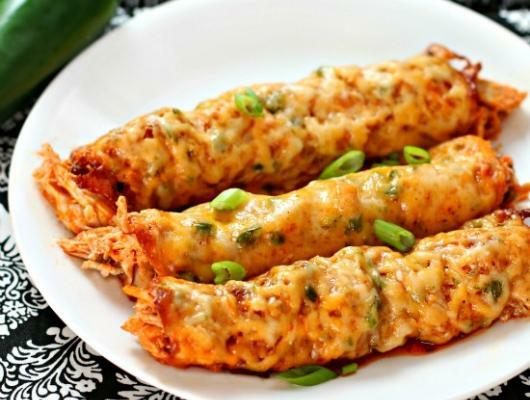 Quickly before the cheese hardens, tightly roll each one into a taquito shape. Enjoy! 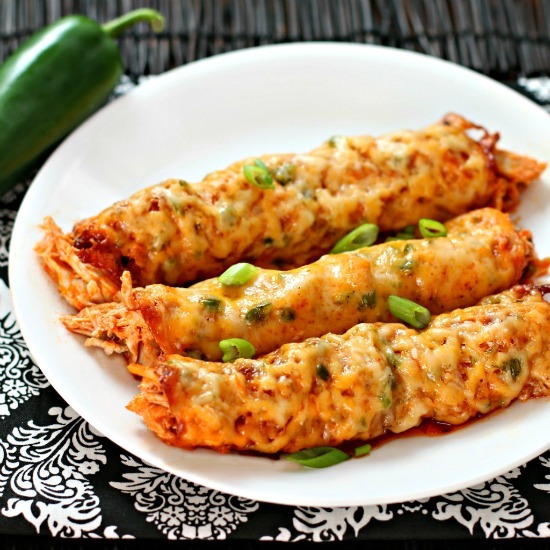 These Buffalo Chicken Taquitos with Baked Cheese Shells are a flavor explosion in your mouth! No flour or corn tortillas used here…only Cheese! It only takes 7 simple ingredients and is gluten free, low-carb and Keto friendly. You have to try this incredibly easy to make dinner, appetizer or afternoon snack that tastes Amazing!